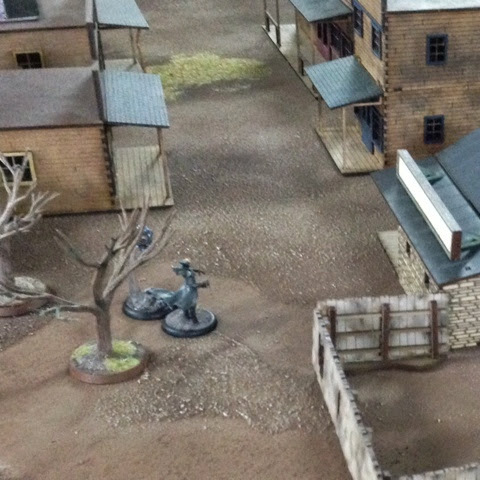 Another Monday, another great evening at Red Steel Gaming Preston, another awesome Malifaux game - and this time around, it was a little different. 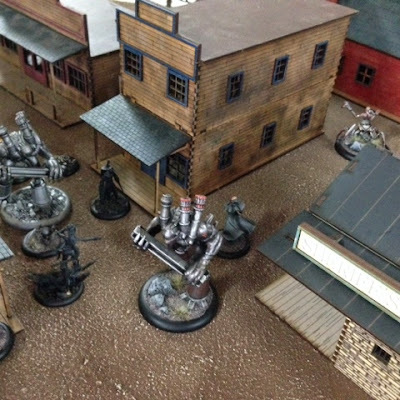 Normally in Malifaux, you and your opponent draw to determine your deployment type, your strategy, and your scheme pool then hire your crew to fit around those parameters. Yesterday, however, I was guiding someone back through The Breach and into their first game of Malifaux 2nd Edition (M2E). My opponent had already informed me that he was taking Mei Feng (minorly annoying at first as I'd have liked to take her this week!) and her crew, with an additional Rail Golem - how many Soulstones could that be? So, I sat and worked it out that with upgrades, a Soulstone pool, the Rail Crew box and the Rail Golem, we could likely fit in a 45ss game. Now, this was to be a returning game - I wasn't hitting the field with the intention to slay and dominate, this time I needed to showcase the kind of trickery inherent in M2E, and display some awesome combos and tricks for both our crews. I also needed to keep the game interesting and not let it get bogged down in a one-sided skirmish. This was someone I was looking to bring back into Malifaux gaming, to add more opponents to our pool and to get him ready for the Malifaux Tournament I'll be running in June. I knew my opponents crew and, being Mei Feng, I knew it very well. I know how she operates, what she relies on to succeed, what some of her crazy little tricks can be. Mei Feng likes constructs and scrap markers, especially for her Railwalker ability (which allows her to 'jump' to a nearby scrap marker or friendly construct, and can be chained repeatedly in the same action and eventually terminates in a Jackhammer Kick). She's fast, she hits like a truck loaded with bricks (or should that be rail sections? ), but she can be quite fragile. The rest of her crew, in comparison, is quite slow, but hard as nails - making them very weak against shooting crews if there's not enough scenery around. So, the perfect counter to Mei Feng would be a shooty crew that didn't drop many scrap markers. Perdita Ortega would be a prime example - Rasputina and Sonnia Criid could also cause her problems. But how about if I purposefully wanted to make things easier on my opponent to show off some cool tricks? Don't get me wrong, I'd still play hard and show off some bendy combos, but for crew selection, I wanted something that'd really make Mei Feng shine. I looked through my Arcanists case. Colette du Bois? Nope. Too jumpy herself, fast and hard to pin down. Marcus? Heavy close quarter fighting with touh scary beasties? I'd out-melêe Mei Feng and trap her from running away. Rasputina? I would drop scrap markers as things died, but I decided against Rasputina as I knew I wouldn't be able to control myself from repeatedly triggering Curse of December until Mei Feng's crew were reduced to frozen corpses. That left Ramos again. Yes, he'd be dropping plenty of scrap markers, he wasn't a particularly shooty master, and I could take my own Rail Golem to show different Rail Golem uses. Sorted. Now for a 45ss crew! I looked at the crew I'd hired last week, and considered it a pretty good crew to take. The trouble was, it was a 50ss crew. I needed to lose five points. After careful consideration, I dropped Joss (for the first time ever in a Ramos crew! Sorry Joss!) and also gave Ramos the Combat Mechanic upgrade for Accomplice and the ability to heal. I opted for Protect Territory and Plant Evidence (for the same reasons as last week - I'd place scheme markers in scenery and then stay close. Each scheme marker would then be 2VP at the end of the game) and as it was a friendly game where I would be explaining a lot, I opted to reveal them both. My opponent then did the same, also taking Protect Territory and Plant Evidence. 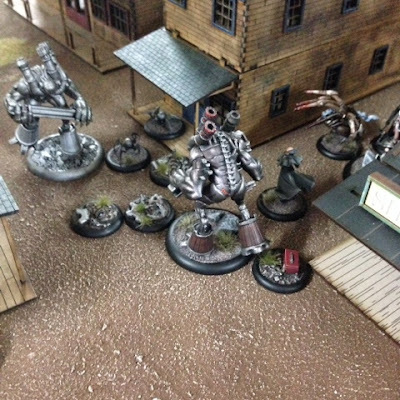 We flipped for deployment, and I set up first, putting Ramos and the Electrical Creation on one flank, and the Rail Golem, Miss Step and the Brass Arachnid on the other side of the Sheriff's Office. 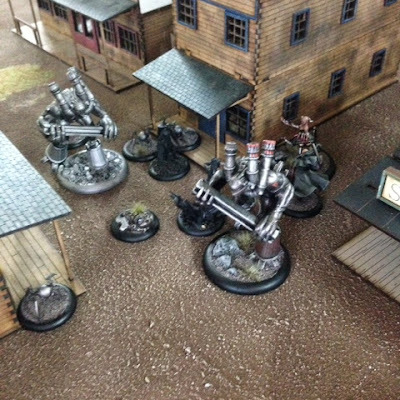 My opponent set up Mei Feng, the Emberling and his Rail Golem on the Main Street, staring at Ramos and the Electrical Creation. Kang lead his three Rail Workers behind the buildings onto the back street next to the barn. This would be a bloodbath early on, I mused, and flipped for initiative which I fortunately won. It was time to pull off my usual starting gambit. The Electrical Creation drifted forward twice, as usual, and after my opponent walked a Rail Worker forward up Main Street, I activated Ramos. His zero activation of Magnetism pulled him forward and exploded the EC, dropping a scrap marker, which he then used to summon three Steam Arachnids. He three up an Arcing Screen and then took cover behind a building. Then came the Rail Golem. It activated and charged up Main Street and smashed a Steam Arachnid back into scrap. Now, I wanted to try a new trick. Miss Step scrambled forward three times, thanks to her Nimble ability, then chain activated the Brass Arachnid with its Companion Ability. The Brass Arachnid rewired itself, then restoked itself ready for future reactivation. Kang led his Rail Workers forward alongside the barn, ready to flank Miss Step and my Rail Golem. 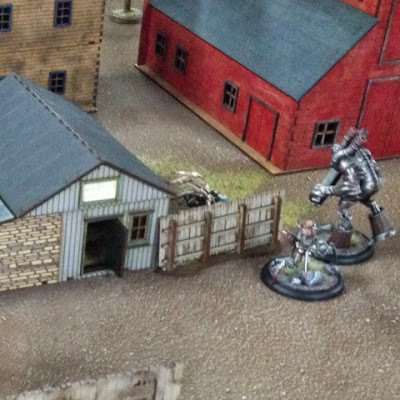 My Rail Golem activated and took up cover at the end of the back street, waiting for Kang, then the Brass Arachnid reactivated with Companion, and tried to Stoke both the Rail Golem and Miss Step, but failed to give Miss Step reactivate. Mei Feng used her Rail Walker ability to jump to a friendly Rail Worker, then to the scrap marker next to her Rail Golem, then triggered again into a Jackhammer Kick on Ramos, following it up with a flurry of Tiger's Claws that left Ramos battered, bruised and burning. Then my Rail Golem reactivated. Immediately firing up its Locomotion ability (knowing full well I could cheat the Momentum trigger for both of my Burning) and ploughed forward into Mei Feng. Stupidly, I completely forgot that Rail Bash gets a positive flip on the attack duel, and with Mei Feng jumping backwards with her Df trigger, making me waste AP to get back into range, I succeeded in inflicting 9 wounds on her. 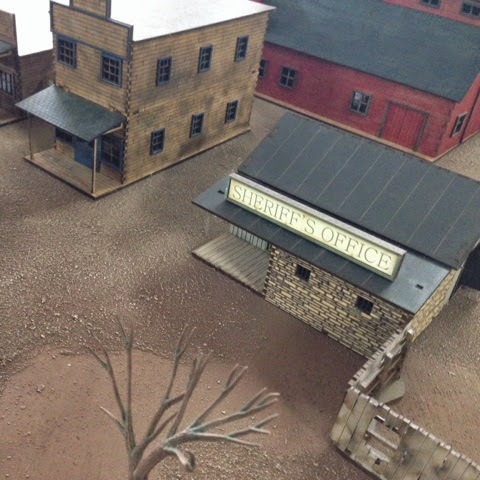 The Emberling then drifted up Main Street and dealt another two damage to Ramos, leaving him on three wounds remaining. The two surviving Steam Arachnids moved next to the Rail Golem to drop its defence. The turn ended, Ramos burned twice to a single wound left, and we flipped for initiative. This time I won the flip and immediately activated Ramos. I detonated one of the spiders, dealing four damage to a Rail Worker (well, three, thanks to Hard to Kill) and causing my opponent to cheat to save the Rail Golem from damage, though Mei Feng leapt deftly aside. Still, I'd burned cards from my opponents hand and left a Rail Worker on one wound. That was all secondary to Ramos healing two damage from 'Opportunist'. He then Summoned two more Steam Arachnids (in base contact with the Rail Golem and the Rail Worker) then threw up an Arcing Screen. He tried to magnetise the Rail Worker to death, but flipped a Black Joker. Mei Feng activated next and, unable to reach Ramos, proceeded to deal inordinate amounts of damage to my Rail Golem and punched another Steam Arachnid into scrap before ducking for cover. Then my Rail Golem activated and decided that it didn't need Mei Feng smacking her around and instead flattened the Emberling with a Red Joker on the damage flip of a Rail Bash (did that to the totem last game too! ), then pulverised the Rail Worker, earning me a Reckoning Point. The Rail Golems duelled for a moment, but nothing much happened. Then Miss Step activated and all hell broke loose. She skittered across to Mei Feng with her Nimble AP, declared a Flurry and swung her claws, triggering her Decapitate trigger (which would kill Mei Feng unless she discarded two cards (which she couldn't) or two Soulstones). Mei Feng burnt two Soulstones and took a little damage. Then Miss Step swung again, and I cheated the trigger, forcing Mei Feng to burn two more Soulstones. Finally, Miss Step swung a third time, but didn't need the trigger to take off Mei Feng's last wound, killing her. My opponent now had no Soulstones left to burn. Considering I had burned all of mine to keep Ramos alive, I felt suitably avenged. My Steam Arachnids scuttled around placing Scheme Markers as Kang lead a brave charge deep into my lines from the side. Ramos barely survived having hot coals thrown over him, and Miss Step took some severe damage when Rail Workers, inspired by Kang's presence and immune to her Terror, ran up and proceeded to beat her with their Replacement Limbs. Turn two ended, and both of us had claimed a point for Reckoning. Turn three, and my opponent won initiative. Kang shovelled coals onto Ramos, finishing him off and dealing light amount of splash damage to Miss Step. Miss Step in turn failed to kill Kang. His Rail Golem attempted to rampage away, but failed its charge when a Steam Arachnid's disengaging strike held it firm. It's Locomotion was more succesful, allowing it to break free of the Steam Arachnids, but it failed to trigger Momentum and ground to a helpless halt. My Rail Golem then activated and proceeded to flatten two Rail Workers, earning me a point for Reckoning. With my opponent out of activations, my Steam Arachnids scuttled around dropping more scheme markers, and the game ended due to time. I had four Scheme Markers down, all in my opponents half of the board, and all with a non-peon within 2". This meant all four markers counted towards both Protect Territory and Plant Evidence, and as I had revealed both, I earned an additional VP for each scheme. However, Schemes cap at 3VP. My opponent and I shook hands, and we had a laugh about some of the funnier moments in the game, and my opponent commented that he needed to learn his crew much better (he hadn't understood the true potential of Kang's abilities) and asked for advice. Having run Mei Feng a lot myself, I knew the two biggest issues I have with her crew. I enjoy Railwalking too much and usually throw her face first into combat (sometimes as early as turn 1) but this usually leaves her deep in the enemy lines and unsupported, and she can't take that resultant beating. Secondly, as her crew is quite slow and hitty, it's very tempting to spend all your AP running up to things and dealing high damage. He had done it this game and I'm often guilty of it too. It means you're not completing schemes (unless you have Assassination and Make Them Suffer) and it really is the schemes that win you the game. 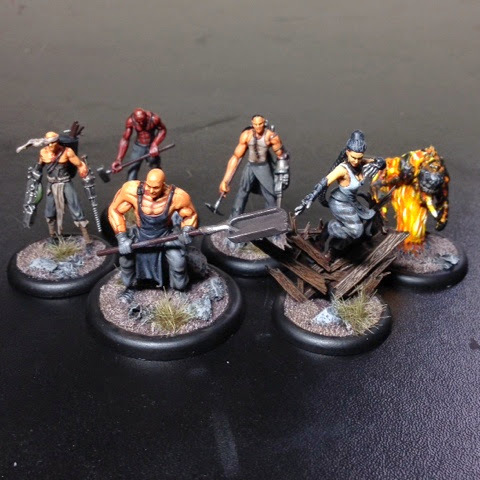 He's adamant to learn his crew now, ready for June's Malifaux tournament (that I'll be running!). I can't wait to see how he does!